Net sales amounted to SEK 310 M (295). Net sales adjusted for change related items were SEK 310 M (295), an increase of 5% or 0% adjusted for changes in exchange rates. 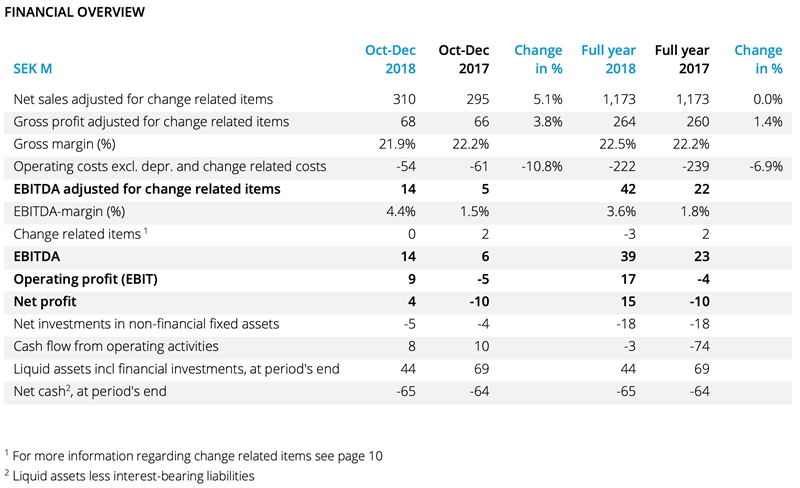 Gross profit adjusted for change related items was SEK 68 M (66), an increase of 4% or a decrease of 1% adjusted for changes in exchange rates. Gross margin adjusted for change related items was 21.9% (22.2). Operating costs excluding depreciation and change related items were SEK 54 M (61), a decrease of 11%. EBITDA amounted to SEK 14 M (6). Adjusted for change related items, EBITDA was SEK 14 M (5). Capitalised expenses for product development were SEK 5 M (4). Cash flow from operating activities was SEK 8 M (10) and the sum of cash and interest-bearing financial assets was SEK 44 M (69) at the end of 2018. Net cash in the fourth quarter increased by SEK 4 M to SEK -65 M.
Earnings per share, before and after dilution were SEK 0.10 (-0.22). On 8 November 2018, Reworld Media announced a public cash offer of 3.17 SEK per share to the shareholders of Tradedoubler AB. The acceptance period ran out on 11 December and Reworld decided not to extend it. After the offer Reworld Media holds approx. 40.21 per cent of the shares in Tradedoubler. Net sales amounted to SEK 1,173 M (1,173). Net sales adjusted for change related items were SEK 1,173 M (1,173), which was a change of 0%. Gross profit adjusted for change related items was SEK 264 M (260), an increase of 1% or a decrease of 4% adjusted for changes in exchange rates. Gross margin adjusted for change related items was 22.5% (22.2). Operating costs excluding depreciation and change related items were SEK 222 M (239), a decrease of 7%. EBITDA amounted to SEK 39 M (23). Adjusted for change related items, EBITDA was SEK 42 M (22). Capitalised expenses for product development were SEK 18 M (18). Cash flow from operating activities was SEK -3 M (-74). Earnings per share, before and after dilution were SEK 0.34 (-0.23). The Board proposes that no dividend should be declared for 2018, no dividend was declared for 2017. In March Tradedoubler announced a tender offer and a written procedure of its outstanding bonds due in 2018. The result of the tender offer and written procedure was announced in April where the request received acceptance by 100 per cent. Approx. 96 per cent of the adjusted nominal amount participated in the written procedure and approx. 95 per cent of the adjusted nominal amount did also tender their bonds. Payment to the bondholders was made on 16 May 2018. In May Tradedoubler signed a new financing agreement with a Swedish credit institution of SEK 71 M. In addition, the company entered into a loan agreement with its principal owner Reworld Media S.A for SEK 40 M.
“Tradedoubler´s results in the fourth quarter 2018 confirm the positive business trend of recent quarters. With Q2 we have been able to stop the decline of the business we had in previous years. Since then we deliver revenue and gross profit results on the level of the year before, but with significantly improved profitability. The confirmation of this trend in Q4 is an important indicator for us, as the fourth quarter is the most important quarter for our business. The EBITDA of SEK 14 M in Q4 is the best result we had in the last years. The main reasons for the improved results are the repositioning of Tradedoubler with a full focus on affiliate marketing and the matching re-organisation of the company. This increased focus leads to reduced churn, a higher win rate of new clients and efficient processes. We create growth for our clients and partners based on our network, our technology and our expertise. We are able to do this efficiently, improving our own profitability. This information is information that Tradedoubler AB is obliged to make public pursuant to the EU Market Abuse Regulation and the Swedish Securities Markets Act. The information was submitted for publication, through the agency of the contact persons set out above, at 08.00 CET on 7 February 2019. Numerical data in brackets refers to the corresponding periods in 2017 unless otherwise stated. Rounding off differences may arise.